.... Many atheists today claim that Christianity is "offensive" in some way or another. Kierkegaard would say this is quite in order — Christianity is offensive and must be so in order to remain what it is. The offensive aspect of the difference God makes to goodness is one that Kierkegaard thought Socrates missed, as he believed anyone without the benefit of revelation would have done, no matter how wise they were in other respects. 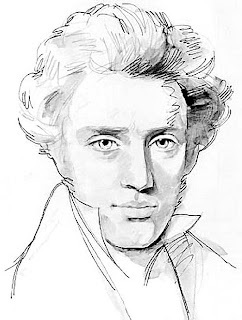 So the really interesting question to Kierkegaard would not be whether people can be good without God, but a twofold problem of how to explain why so often they are not good, with or without God, and what to do about that failure. That they will fail to be good is a reality to which all parties must concede. Take the most depleted moral code you care to posit, set the bar as low as you like, and the universal experience of all human beings, from the most morally ambitious to the most scandalously indolent, is failure. For Kierkegaard, the first article of Christian faith as opposed to pagan philosophy is not the reality of salvation but sin, which logically has to come first as that from which we stand in need of salvation itself. And for him sin meant wilfulness, of a kind and to a degree that even the great Socrates would never have imagined possible. Religious revelation shows us, Kierkegaard thought, that, while it is certainly the case that people can be good with and without God, with shocking frequency they are not good, and they are not good not because they simply lack knowledge of what is good but because they don't want to be good. Socrates could never have believed that people were capable of knowing the good and simply refusing to do it. Kierkegaard, on the other hand, thought that the Christian tradition taught that all too often people do what is bad because it is bad. If you are as convinced as he was that perverse, wilful evil is not only possible but commonplace, then Socrates's view is bound to appear dangerously naive. It is also a view that you could predict human beings would come up with to suit themselves; the Socratic view can be perceived as conveniently self-exculpatory: No one is that bad, just a bit confused.